Projects include an executive desk made from beautiful Cherry Vineer, a product from Dow Bioproducts! This small desk is designed from a one hundred-year-old antique that was handed down from grandmother to daughter to grand daughter. 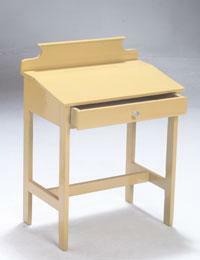 It features mortise and tenon joinery in the leg system of both the desk and matching bench. There is one drawer for storage and a sloped writing surface with a pencil slot to thrill a preschooler who wishes to mimic big brother or sister by playing �school�. Watch episode #1201 of the Router Workshop for building tips from Bob and Rick Rosendahl. Bob�s Aunt has used a hexagon stool for seventy years as a telephone seat. The hexagon stool has a six-sided top. The six legs are identical with pattern cuts and beveled slots. They are fastened together with a glued spline system. Special screwing blocks are used to attach the top to the legs. Watch episode #1204 of the Router Workshop for the router procedures used by Bob and Rick Rosendahl in the hexagon stool. The legs for this table are multi-pieces of thin wood bent in a half circle, glued and clamped in position until set. A stringer between the half circles strengthens and divides the legs. Top rails hold the table together and support the beveled glass top. Watch Bob and Rick in episode #1208 of the Router Workshop for tips on the router construction of the bending fixture and the table parts. 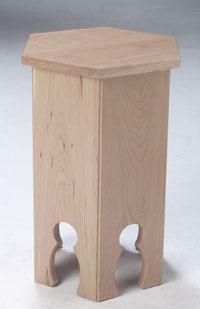 The Queen Anne legs are dovetailed into patterned rails. The low base-table is completed with a molded top to hold the chiffonier chest of drawers or as an accent table for use anywhere in the home or apartment. For router tips and procedures on this base table, watch episode #1209 of the Router Workshop program. This tall chest of drawers is designed to be a companion to the Lingerie Chest, built in Series 600 of the Router Workshop. 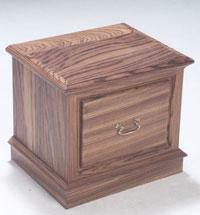 Plywood side panels, a molded top, and flush drawers combine to make an exotic furniture piece. We used the Queen Anne base table (episode #1209) as the base for the chiffonier. Dust panels between the drawers act as drawer slides. Watch Bob and Rick Rosendahl rout the pieces for this chiffonier in episodes 1210 and #1211 of the Router Workshop TV program. 1210. Chiffonier Part 1, Case and Panels 1211. Chiffonier Part 2, Drawers. This box for blankets is paneled on all four sides and constructed of fiber-board made with straw. This material allows either a clear finish (as we have used) or it can be painted or stained as desired. 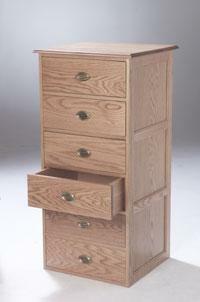 A plain rounded lid and castors for easy moving complete the features of this storage. Watch �the Router Workshop� Episode #1212 for techniques used by Bob and Rick Rosendahl in the Blanket Box. This intriguing tray has angled sides, box joints and heart handles. These handy trays make bowls for fruit or snacks, hold mittens or hats, act as a letter holder, picture storage or mail bin. Make several in different sizes. The beveled bottom is glued and wedge-fit inside the tray. The top edge of the tray is also beveled. For tips on compound angles, box joints, heart patterns and beveled sides watch Bob and Rick in episode #1213 of the Router Workshop TV program.